What scares IT security more than hackers? We commissioned the Ponemon Institute to answer that question and then some. In a survey of more than 1,500 IT practitioners from around the world, they reveal what’s worrying the people tasked with protecting the enterprise’s most sensitive data. With the rise of the data-centric enterprise, there is a necessary and parallel development of the security architecture meant to protect it. But in the time it’s taken for data security to catch up with the changing datascape, organizations have found their compliance and data protection programs vulnerable. 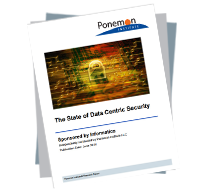 Read ‘The State of Data Centric Security’ report for illuminating insights into the security challenges facing the modern enterprise.